Next week, Lamborghini will reveal the Urus, the brand’s first sport utility vehicle since the classic LM002, but ahead of the reveal an Instagram user by the name of toysforboysbrasil has posted some photos that show the wild SUV’s interior completely uncloaked. 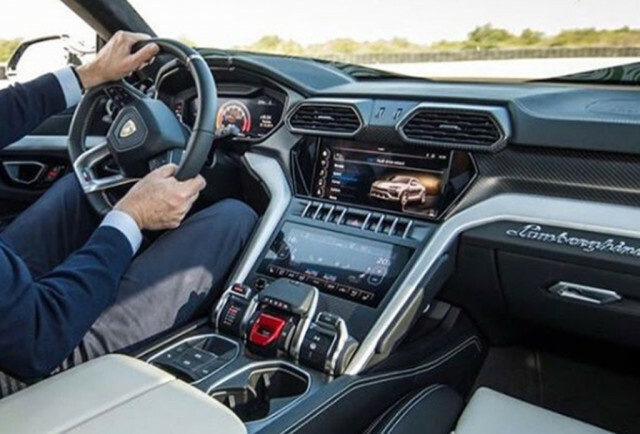 The Instagram post shared two photos of the Urus’ interior, which houses typical Lamborghini interior styling. And one of the shots shows a depiction of the Urus’ exterior design in the infotainment screen atop the center stack. The Urus’ center stack features an angled design, and a chunky flat-bottom steering wheel sits in front of the driver. The entire gauge cluster looks digital. The starter button is located in the typical Lambo position: under a red cover at the base of the center stack. It appears that the shifter is located just in front of the starter button and the mode selector is off to the left of it. It also looks like the cabin is wrapped in plenty of leather accented by metallic trim. It definitely appears to be a pleasant place to spend some time. We expect drivers sitting inside the Urus will look over a hood housing a 4.0-liter twin-turbocharged V-8 with an estimated 650 horsepower. Power will likely find its way to all four wheel via standard all-wheel drive, too. We’ll have full details on the Urus when it debuts on December 4. Stay tuned. Denso to help study car-sharing technologies in Mich.